Lace up. Nike is about to drop the new range of Air Force 1 for women, and we’ve managed to nab a sneak peek. 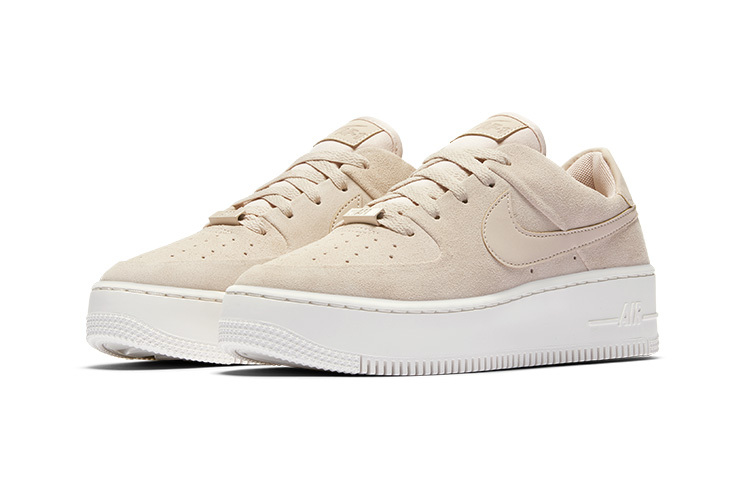 Meet the Air Force 1 Sage Low, the next expression of “The 1 Reimagined” (as Nike insists on calling it). Redesigning the silhouette of something like Nike’s AF-1 was always a tough gig. The basic structure has been around since 1982. Nike handed the job to a group of female designers and basically said, “Make it look cool.” The brief was to stay true to the shoe’s DNA, but create something slightly more feminine, “custom-built for her.” Whatever that means. The result is something that still looks vaguely like an AF-1. Only chunkier. The Sage Low collection has a wedge midsole and paired-down upper. The traditional overlays have been scrapped and replaced with rolled edges. We’re still digging those comb-like teeth on the mi-sole as well. Pint-sized Nike fans will also be happy to know they’ve increased the stack height by 35%. Get ready to reach shelves you’ve never reached before. From what we know so far, these will be available in three colours: triple white, triple black and dusty pink. Nike AF-1 Sage Low is dropping this week, so start moving some funds around. They’ll be hitting shelves and nike.com from 10am on 5 October. That’s Friday, just FYI. RRP $170.